As with its ancestors, Encarta 97 is heavy on interface. The look-and feel is appealing, if not as friendly as I would have liked. It shares with its parents several quirky interface metaphors which take some getting used to. For one, it eschews vanilla pull-down and pop-up menus for animated "unrolls" which are the undoing of most A-type personalities. The delays which the animation produced are unnecessary and unwelcome. This seems to be a classic case of the technical imperative at work - adding technology for its own sake. Equally unwelcome is Encarta's intolerance of double mouse-clicks. Such things can inadvertently take you into Encarta crevices which are light years away from one's interest. The frustratingly slow response rate (on our 150mhz pentium workstation exacerbates the problem, for one must wait a second or so in some cases for the menus to unfold. A far better approach would be to accept single and double mouse-clicks as equals and try to minimize the intervening menus. 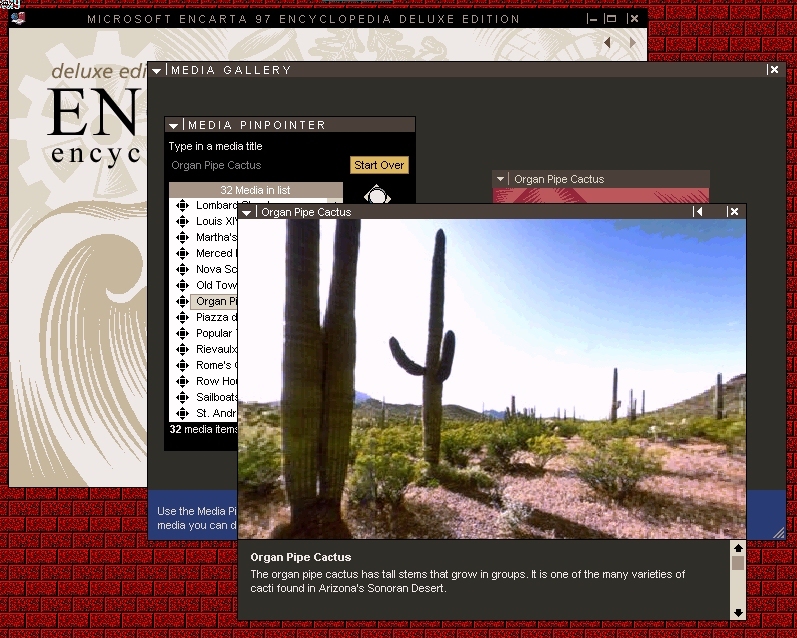 Encarta 97 Deluxe boasts 15,000 video clips, which is very competitive by modern CDROM encyclopedia standards. Regrettably, many are subsumable under the label of gratuitous video bytes with little content. There are of course many videos which provide informative, useful vignettes to accompany Encarta's articles, e.g. "Berlin Wall" (including John Kennedy's "I am a Danish pastry" speech), "Women's Suffrage in the U.S.," , "basketball". But too many are too brief and contain too little information to be of much value (e.g., "childbirth, "Satchmo sings 'Back of Town Blues'," "Locusts in Flight." Their presence suggests an attempt to fill the CDROM without giving much thought to purpose. While I'm on this subject, I should point out that the indexing interface for the multimedia is less than optimal on two scores. For one, the process of entering a search term is painstakingly slow. In fact, the experience is reminiscent of the early DOS word processing programs which couldn't keep up with the keyboard type-ahead buffer. Second, the search engine seems to be of an exact-match, ASCII string type. You will not find the "Satchmo..." title by entering Louis Armstrong, for example. The 32 360-degree rotations are another thing entirely. This is an important addition to a multimedia encyclopedia for there's really no other simple way to deal with 3-dimensional parts of stories. The 32 available egocentric (as if rotating on a tripod) rotations take us to such places as the Cathedral of Notre Dame, a harbor in Bermuda, in the Badlands, etc. They add considerably to the text descriptions. While the rendering of the rotation is less than stellar, it is effective and convincingly demonstrates the utility of this tool. Regrettably, the interface is not always logical. Objects (e.g., "organ pipe cactus") which call for exocentric rotations (rotations around the object) have egocentric rotations, which makes little sense. In the case of the pipe cactus, the rotation is really a 360-degree swath through a desert which contains, among a great many other things, pipe cacti. Since exocentric rotations are becoming common in CDROMs now, one must presume that Microsoft will get on the bandwagon soon. In addition, there's an interface kludge involved in the selection of a rotatable scene since the selection does not spawn a still-frame within the rotation, but rather a clip-art graphic which remains inert up to the time of the mouse click. The rotation actually takes place in a separate expansion window. This is a retro-dorsal way of handling this. An illustration of Encarta 97's 360-degree rotations. Nice idea hampered by too many layers of interface and a misplaced metaphor. Object-oriented rotations should be exocentric rather than egocentric. Note that while this rotation is supposed to be about organ pipe cacti, the center image is of a saguaro! As is typical with the better encyclopedias, Encarta 97 Deluxe is awash with hyperlinks to Web resources (approximately 300,000 it is claimed). Microsoft routes the requests which we made through the Encarta Web server at encarta.msn.com/encyclopedia/weblinks with the query parameters passed through the CGI query string variable. While this makes maintenance much easier, it has the downside of retaining subsequent access control on a proprietary server. That is, you don't buy the links when you buy the CDROMs, you just buy access to the links throught Microsoft's server for a limited period (it appears to be one year in this case). If Microsoft decides to charge too much for this service, or if the bandwidth demand on their servers become too great, the end-user is left "linkless" as it were. Word to the wise to Windows NT 4.0 users, Encarta 97 Deluxe is not seamlessly integrated as it is with Windows 95. We couldn't get the collages to render and play on our NT workstation despite the installer's claimed success. But enough does work that Encarta 97 Deluxe is still a useful addition to a multimedia encyclopedia library, if not the leader of the pack.